A small aircraft crashes in the desert outside the small Arizona town of Redemption. One man walks away from the wreckage, though he is unsure of whether he was actually on the plane. He is, in fact, unsure of anything, his mind wiped clean, his knowledge of who he is and where he comes from gone. He soon discovers that his name is Solomon Creed, and that he is in Redemption to save a man named James Coronado, a man who the town is burying at the time Creed arrives. Redemption, like any small town, hides many secrets, and the town elders have good reason to worry, not because Solomon Creed has arrived in their midst, but because there was a precious package on board the crashed plane, a precious package that could spell the end of the town, unless they can use Creed’s sudden appearance to their own advantage. The eponymous hero of Simon Toyne’s new novel is a complete enigma – to himself, to those he meets, to the reader. Striking – albino-like – in appearance, he stands out, and his odd mannerisms serve only to emphasise this strange man in our minds. His immediate clash with Redemption’s chief of police and the unusual pieces of information that surface in his mind as and when he needs them – pieces of information that have nothing to do with who he is, or why he is in Redemption – give us some ideas of who he might be or, at the very least, what his past may have entailed. Toyne never – at least until the novel’s closing pages – goes farther than suggestion, and so we are left with this enigma and our own guesses as to how he ended up in this small Arizona town, and what he hopes to accomplish here. The town itself plays an important role in the story, its history and people integral parts of the bigger picture. Like his fictional city of Ruin, this small town is perfectly-formed, and presented to the reader in such a way that we feel we know it, we know the people who inhabit it, and the dirty little secrets that they think they hide from one another. It feels like somewhere we’ve been before, yet another testament to Toyne’s ability to infuse his novels with a definite sense of place, making the location come to life in the same way that his characters do. 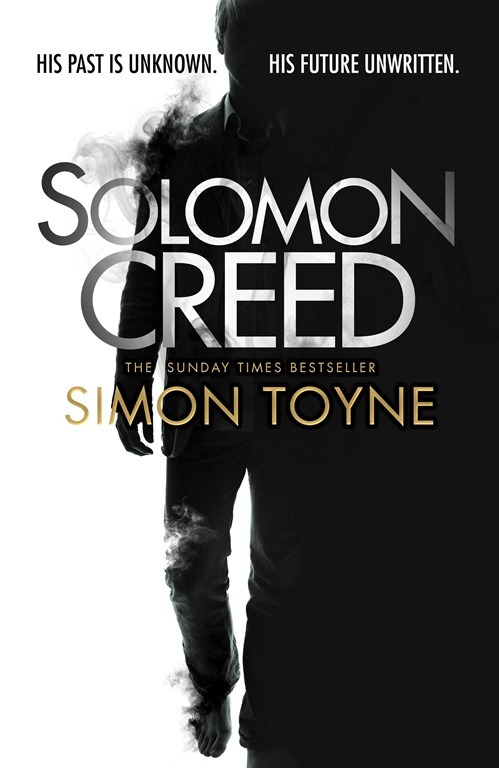 Solomon Creed is Simon Toyne’s first post-Sanctus venture, and is a much different beast from that lauded trilogy. Palpably tense from the opening pages, the author has crafted an intelligent, well-paced thriller that brings together the best elements of small-town America, lost treasure and Mexican drug cartels in a single, coherent, gripping whole. Interestingly, the novel does share one of the earlier trilogy’s key features: at the centre of this plot, and of the lives of the people who live in the town of Redemption, is religion (or, perhaps, Religion? ), though here it is of a much more mundane variety than the secretive monks of Ruin’s Citadel. Toyne uses the town’s history, and the story of its founder, to examine the question of faith and to consider what it is that forms the foundation of these peoples’ faith. For the most part, the story is centred around the location of a long-lost treasure hidden by Redemption’s founding father. As Solomon Creed learns more about the town, it becomes apparent that the accident that killed James Coronado may have been something much more sinister. Along with Coronado’s wife, Holly, he tries to discover why anyone would have wanted him dead, and discovers that the town’s elders may be hiding much bigger secrets than is at first apparent. So, what is it that sets Solomon Creed apart from the multitude of action heroes? It’s the sense of mystery and the author’s wonderful ability to drip-feed the information he wants us to know to keep the story and the character fresh and engaging. It’s the way in which knowledge and useful skills come to Creed out of the blue, as if he’s connected to the Internet, networked in the literal sense; Creed is no Superman, but we get the feeling that he might be able to do anything the Man of Steel could do and more. Think of The Matrix’s Neo learning Kung Fu, and you’re close to understanding the scope of Creed’s untapped mental resources. And therein lies his defining trait: Creed is not an action hero, not in the traditional sense; he is a man with a purpose, a man more likely to think his way out of a sticky situation than shoot his way out, but a dangerous man to be on the wrong side of nonetheless.